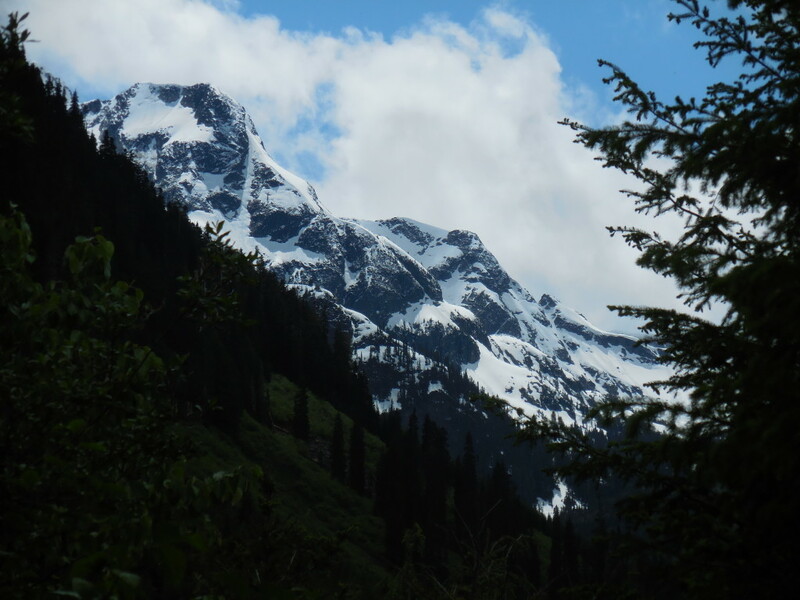 This is going to be one of two trip reports about (the most recent) Lizzie Creek workhike – and apparently the other report is going to be better. 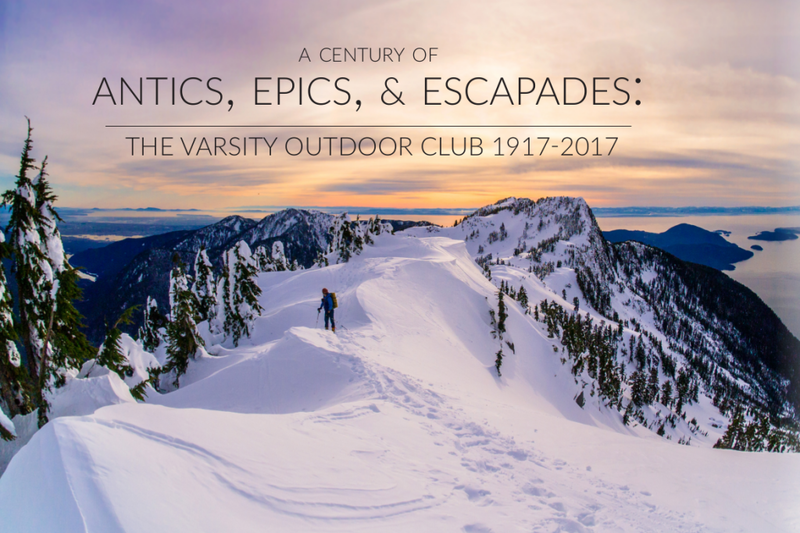 Anyway, this is the one where we mostly talk about what needs to be done to the trail, rather than the one where we recount jokes and adventures. Some jokes and adventures are however recounted free of charge. I’ve also summarized what I think the trail needs at the bottom of the page. On Friday afternoon five of us drove up towards Lillooet Lake to wallow in the hot springs before hiking up the Lizzie Creek trail Saturday morning. We arrived slightly too early at Skookumchuck, which disappointed Roland Burton because that meant he had to keep his clothes on longer, until it was darkish. So we disrobed incompletely and waded around the pools, trying not to disturb the couple eating each other’s ears two tubs over, before soaking a bit (that’s foreshadowing, everyone) and sleeping early. By the way, the name of the hot springs has been changed to ‘Tsek,’ pronounced ‘chick,’ which is more authentic and definitely easier to pronounce and remember. On Saturday morning we drove to the Lizzie trailhead, met up with two more carloads of VOCers, and stepped out to meet the rain. We chose the lower bypass this time, which is a narrow and precipitous goatpath that is not for the faint of heart (nor the clumsy of foot). The lower bypass is one of three options for avoiding the washout on the old road: The upper bypass alternative involves less cliffy sidehilling, but it’s quite long and involves a sharp little boulderfield and some balance. 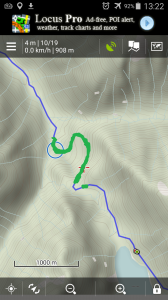 If you don’t like the upper and lower bypass options, and if Lizzie Creek is low (as in winter), apparently you can also ford the creek down at the washout and rejoin the trail further on. One or both of the bypasses seem to need a fair amount of work (details below), although it may not be worth maintaining both of them. After the bypass, we hiked up the old road as the rain increased. (At this point the lemon-meringue pie I was carrying for the dessert potluck worked its malice: I tripped on a rock, and landed on my face in a stony trickle with the pie held flat and gently in front of me). The thimbleberry bushes along the old road were crowding the trail too much, although we did clear some of them while hiking through. 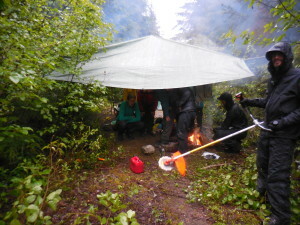 Anyway, they were soaking wet – and when we dripped into our campsite (just before the circular clearing/helipad about 200 m before the one-log bridge) we were 12 very soggy VOCers with very wet almost everything. The tarp Julien Renard strung up across the trail was a godsend. To warm up a bit, we soon decided to do some work. 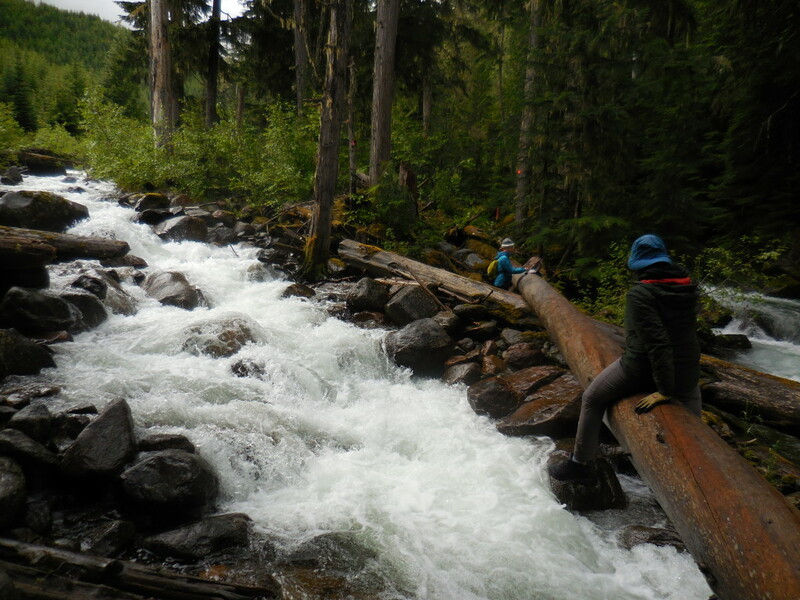 We crossed the one-log bridge au cheval with the death machine (alder saw) and a whole bunch of loppers. Simon Litchwark froze his thighs by trying that in short shorts. Last November we had cleared about a third of the trail from the bridge to Lizzie Lake on a similar expedition. Unfortunately, winter and the addition of wet leaves to the alder had significantly narrowed the path we had cut, so that it needed to be widened everywhere and in many places totally re-done. So future workhikers, remember! The trail should be as wide as possible, ideally to 3m or more. The one-log bridge is a bit of a problem. When the water’s low and the rocks are dry the creek can be crossed at the old bridge site, with a couple sketchy hops. But that’s not a great solution – and the one-log bridge is creaky and possibly not very trustworthy in the long term (although we had multiple people on it at the same time). Some kind of new bridge is needed at the old bridge site, where the embankments are high enough. Probably Cassandra Elphinstone or Rich So has already suggested this. Roland recommended using a suitable piece of aluminium scaffolding, which has been done before. That evening we had a very necessary fire and ate a bajillion desserts. Notably, Lea Zhecheva, our valiant leader, had provided a Cake of Remorse (a big chocolate cake with “sorry” written on it). She had transformed into a bailosaurus and bailed on the previous Thursday because she hurt everywhere and was totally exhausted (fair enough). Luckily, the Cake mollified the ignoble trip members who were muttering that she’d actually bailed because of the rain – which we know to be false. The next day Roland woke us with the roar of the death machine and we tromped out to kill more alder in the sunshine. We made good progress clearing or widening the trail beyond the one-log bridge. The two green blobs I drew on the map stolen from Rich So’s blog post (http://richso.blogspot.ca/2015/11/lizzie-lake-road.html) mark the extent of the cleared trail. There is a flattish stretch of grass near the end of the first cleared stretch (just before a rockslide) that we agreed could take 3 or so tents. That’d save a future work party hiking up and down the hill and across the log all the time. There’s also a little trickle of water across the path for drinking water (not super dependable), but probably also access to a creek that should be nearby. We think that a team with a death machine, loppers, and 10 or more people could likely clear the rest of the path to the lake (1.5-2 km) in a weekend if everyone’s elbows were greased. The alder’s really thick, though – thick enough that some of the time it might be easier to bushwhack off the trail than on it. It’s a dense thicket of inward-curving alder roughly two to six centimeters in diameter. Beyond that, people from the last expedition tell us that there’s lots of blowdown past the lake that needs to be cleared. We also decided that the death machine should be taken into the shop for service before the next trip: it may be having trouble with the transmission. A couple new blades and the tools for changing them are also good to bring. Maybe we could return to Lizzie and finish the path to the lake later this summer. The trail to the lake is quickly becoming too overgrown to be a trail. 1.5-2 km left to do. Something sturdy that can be skied? The lower bypass needs to widened (dug into the hillside more) if possible, since at the moment it’s not skiable (although maybe the upper bypass is). Maybe we could go all out and do something with rebar and wood to make the trail wider. It could also use more rope railings/hand lines and a thicker rope for the 8m or so steep section just before it descends to the road. Alternatively, the upper bypass could be improved (we didn’t hike it this time, so details are lacking). A weedwacker or a scythe or something could help cut back those bushes so that summer hikers don’t get immediately soaked. Chainsaw work? That’s a long way to carry a chainsaw. This entry was posted in Hike, Trip Reports, Workhike and tagged 2wd, beginner-friendly, death machine, hiking, lizzie creek, lizzie lake, Mid Group, Rainy Day, Skookumchuck Hot Springs, Slaying Alder, Weekend, Workhike. Bookmark the permalink. Possibly it’s not necessary to hump a chainsaw all the way in if the Club can obtain a suitably long 2-person bucksaw. Those things are pretty fast.